by Shannon Clark in Giving Birth Naturally | 6 comments | Contains affiliate links. How do you find a midwife or obstetrician? If you are planning to have a natural birth, finding the right midwife or obstetrician to be your care provider is one of the most important decisions you will make during your pregnancy. Finding a care provider experienced in natural child birth who is supportive of your birth plan is absolutely crucial to achieving the birth you desire. The options may seem overwhelming at first, but these few simple steps will show you how to find a midwife or obstetrician that is perfect for you. Most care practitioners see women with low risk pregnancies for their first prenatal appointment when they are somewhere between 8 and 12 weeks pregnant. It takes some time to contact several different care providers, narrow down the right one for you, and then schedule an appointment. Since you don’t usually know you’re pregnant until you’re around 4 weeks along, looking for a midwife or obstetrician should be the very first thing you do after you see that little plus sign. If you have insurance, start by getting a list from your insurance company of the midwives and obstetricians that are in your network. Also ask for a list of birth centers and hospitals that they cover. Most insurance companies now cover midwives, birth centers, and home births. Many states even require that these options are covered. Depending on where you live, this may really narrow down your choices. Especially if you are looking for a midwife, smaller cities and towns may only have a few from which to choose. Choosing a care provider is very closely tied to your birth location. If you already know whether you want to give birth at home, in a birth center, or in a hospital, this may help inform your decision of a care provider. For instance, obstetricians almost always attend women in the hospital. 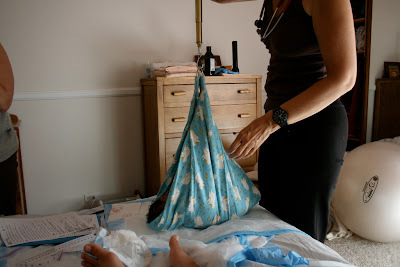 Most Certified Nurse Midwives work in hospitals, while Certified Professional Midwives and Licensed Midwives primarily attend home births and birth center births. Once you have an idea of what care providers are available, you should try to talk to women who have personal experience with them. It is especially useful to talk to someone who had goals for their birth experience that are similar to yours. How did they feel about their midwife or obstetrician? Were they supportive of natural birth? What was the outcome of the birth? It’s always great to be able to get referrals from a personal friend that you already know and trust. However, you may not know anyone who has had a natural birth. You also may not be quite ready to announce your pregnancy to friends and family in the early weeks when you are looking for a care provider. If this is the case, you can also find reviews and referrals on local online message boards. It is a good idea to interview a handful of midwives or obstetricians you are considering. You can spend all day looking at their websites and talking to past patients, but nothing will tell you as much as a short interview with a potential care provider. Most midwives are happy to have you interview them before committing to going with their practice. Some even require an initial consultation before you schedule your first prenatal. An interview is not quite as standard practice for obstetricians, but a good doctor who will be supportive of your natural birth would certainly take the time to answer your questions. The interview is also your chance to ask questions to reveal whether a care provider has the experience and values to help you achieve a natural birth. To achieve a natural birth, it is very important to be relaxed and comfortable in your birth location and with the people who are surrounding you. You can tell a lot from a first impression about whether a particular care provider is a right fit for your personality. In the next post I’ll share a list of interview questions you might want to ask when you’re looking for a care provider. When I found out I was pregnant, I had already ruled out an obstetrician as an option because I didn’t want to give birth in a hospital. I started looking for a midwife as soon as I found out I was pregnant. As for finding a midwife, I was really lucky. There are tons of them in my area, and there were even quite a few on my insurance. Then I checked local message boards online for reviews and information about each one. Once I narrowed down the ones that worked in birth centers that weren’t covered by my insurance, or in hospitals, or were too far away from my home, just one remained. We went for the interview when I was around 8 weeks. After my husband and I interviewed our midwife, we both walked away knowing she was the one. It’s no doubt a miracle and a blessing that I ended up finding my beloved midwife. I hope you’re able to find a midwife or obstetrician that is perfect for you! What advice would you give pregnant moms for how to find a midwife or obstetrician? Thank you so much for stopping by Lora Lynn! That is a great tip. So many women do want a natural birth but are most comfortable in a hospital setting. Great advice! Even though I went with in hospital for all 5, I have the utmost respect for women who have their children in their own home. Thanks for linking up to Parent ‘Hood! This is such great advice! We were overwhelmed the first time, and went based on a referral–we still had a great experience, but when I found out she wasn’t available for this baby, I went to message boards, called around, prayed a lot–and the perfect MW fell into our laps! Thanks! both of my births have been unassisted, but I’ve been considering getting a midwife for next time. You’ve got some nice tips for finding an OBGYN. I like how you said that we can get a list of potential doctors from our insurance. We just moved, and my wife is pregnant with our first, so we’ll have to ask for that.